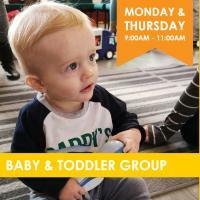 St Matthew's Baby and Toddler group meets on Mondays and Thursday from 9 am - 11 pm (during term time). We are a friendly, free group who love to welcome parents, guardians, grandparents, and carers with their babies and toddlers. We provide toys, craft activities, and free refreshments and have a time of singing and storytelling at the end of each session. We hope that this will be a page where people can find out more about our Baby and Toddler group and also that it can also be a way of networking those who attend. We hope that it will facilitate and support the friendships which are being built through this group.